Cooked chicken breast pieces in a vegetable and mushroom gravy served with a sweet potato, carrot and swede crush and broccoli florets. 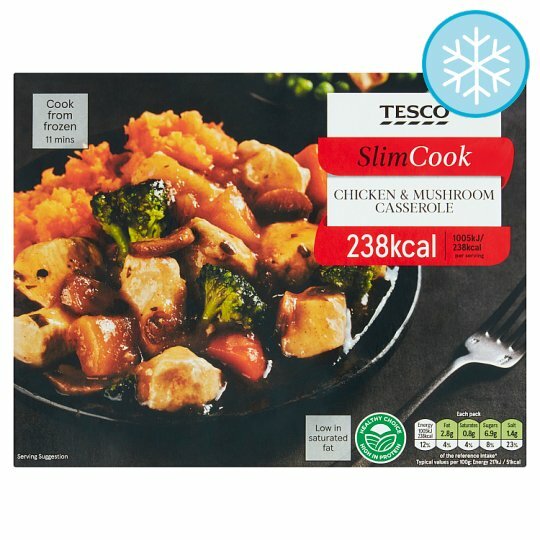 INGREDIENTS: Water, Chicken Breast (17%), Sweet Potato, Carrot, Swede, Broccoli Florets (8%), Mushroom (2.5%), Tomato Purée, Onion, Cornflour, Garlic Purée, Onion Powder, Salt, Yeast Extract, Potato Starch, Parsley, Dried Onion, Dried Tomato, Dried Vegetables (Onion, Carrot, Tomato, Spinach, Garlic), Rosemary, Sugar, White Pepper, Parsley Extract, Onion Extract. Instructions: 200°C/ Fan 180°C/ Gas 6 41 mins Place on a baking tray in the centre of a pre-heated oven for 30 minutes. Peel back film lid, stir both compartments and re-cover. Heat for a further 10 minutes. Leave to stand for 1 minute after heating. Peel back film lid, stir both compartments and re-cover. Heat on full power for a further 4 minutes (800W) / 3 minutes 30 seconds (900W).